Where I've been, what I'm doing, what I’ve seen and what I’m up to next. Teamwork makes the dream work! Thanks to a brainwave by the glaMARous Yvonne O’Kane, the artistic talents of Susan Albright and my own creative direction, I am delighted to reveal my ALL NEW Casual Luxury Westport Map! 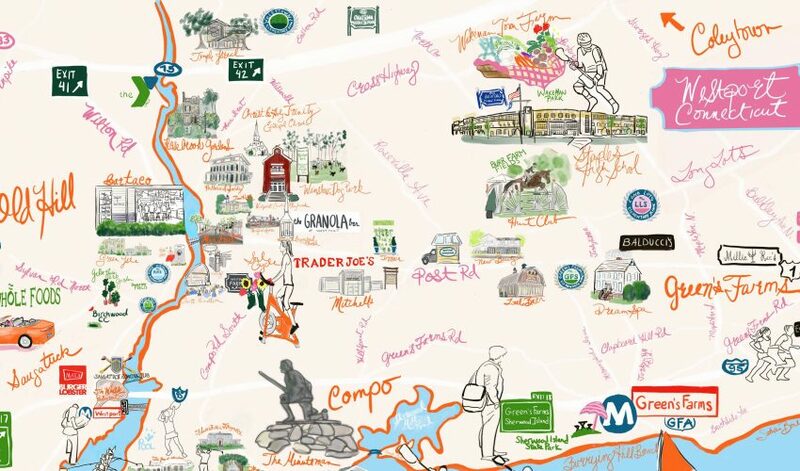 Charmingly rendered, it highlights some of my favorite places (space permitting lol) and iconic Westport locations. As a lifestyle expert, I love being asked for advice and especially for my recommendations of what to do around town. So now in addition to chatting about it I can also hand it out! It functions as an actual map, showing a traveller where to find key geographic locations, schools, business and one very special home. (More on that in a moment.) 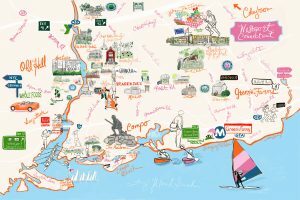 A delightful design, this map is a must-have for those who love Westport, shop in Westport or live in Westport. So share it! (Click on those social media “share” buttons!) In time, it will be updated to add new and exciting places and who knows? Maybe even some more homes, too. As they say in the map business, Mar to come! Now, that one special home? Rather than Where’s Waldo, let’s find my house. Can you spot Rosebrook Gardens? I hope you like it–I’m rather drawn to it myself. What has America’s Top Lifestyle Expert been up to this week? We are always inspired – and sometimes even surprised – by what he shares. With so many interesting people, places and projects in his universe, LIFE ON MAR’S has something for everyone. He’ll tell you where he’s been, what he’s doing, what he’s seen and what he’s up to next.